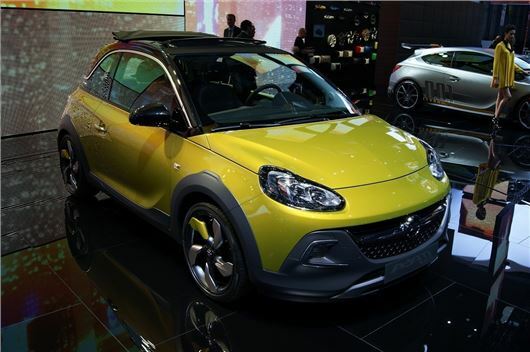 The Vauxhall Adam Rocks has been unveiled at the Geneva motor show. The chunkily styled hatchback has gained SUV styling and features a raised ride height, anthracite-coloured cladding and a new 1.0-litre three-cylinder petrol turbo engine. The Adam Rocks is the first model to get Vauxhall’s new 1.0-litre Ecotec Direct Injection Turbo three-cylinder engine. The Rocks has had its ride height raised 15mm and the suspension re-tuned to make the car more suitable for rugged terrain. It's offered with 17-inch wheels as standard or optional or 18-inch alloys, which can be personalised with new wheel clips in 'Wild' design and different colours that are unique to the Rock trim. The bodywork has been cladded to give the Adam a muscular appearance, with silver skid plates, chrome exhaust and an integrated rear roof spoiler. The Rock trim will also get LED daytime running lights and an electric folding canvas roof to complete its new outdoor look. The roof will take just five seconds to operate and feature a three-layer fabric, which will be available in three colours - Black, Sweet Coffee or Light Oak. Two new interiors will be exclusive to the Rock, with a choice of colour schemes, including dark brown seats with blue stitching. One trim is taken directly from the concept car revealed at last year’s Geneva show, with sporty peanut-coloured fabric and a 'Surf' decor trim. There are no details on pricing, but expect to pay around £15,000 when the Adam Rocks goes on sale in the summer of 2014.